Bienvenidos y welcome to Mastication Monologues! 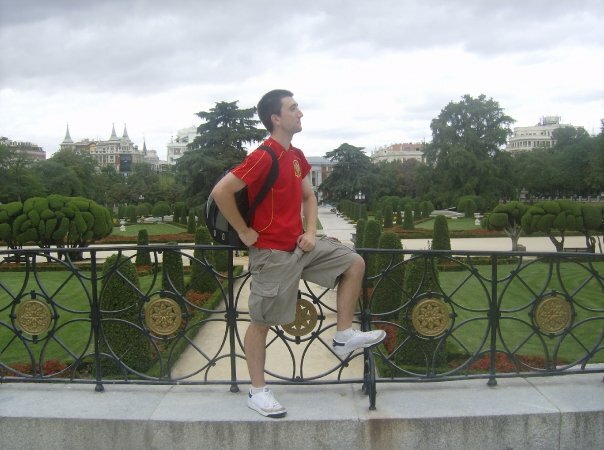 If you’re reading this, you’ve finally reached the end of my throwback Europe series. 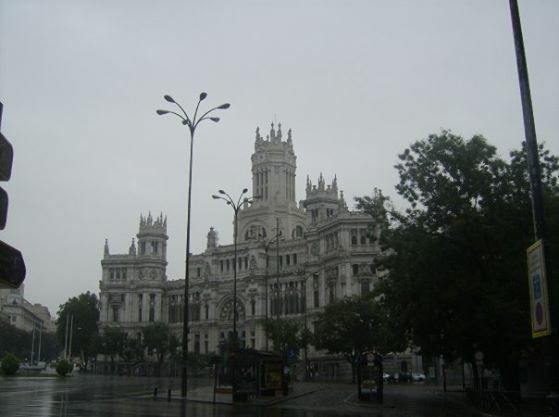 We’re touching down in the heart of the Iberian peninsula in the ageless city of Madrid. Home to the Spanish government and monarchy, Madrid is the imposing and more regal version of Spain’s more laid back second city, Barcelona. Everywhere my friend Kevin and I turned, we were confronted with another piece of history. Royal palace? Check. 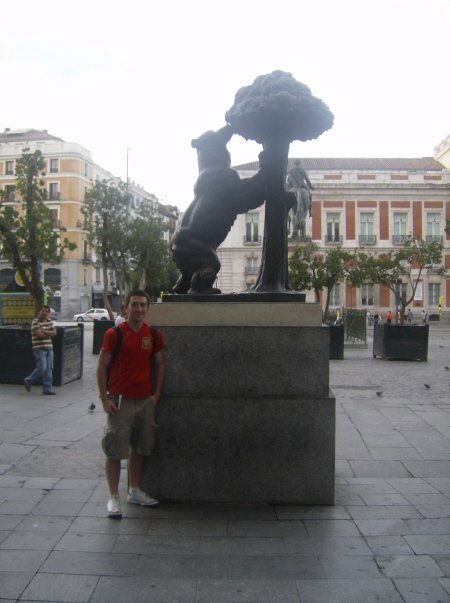 El Prado Art Museum? Check. 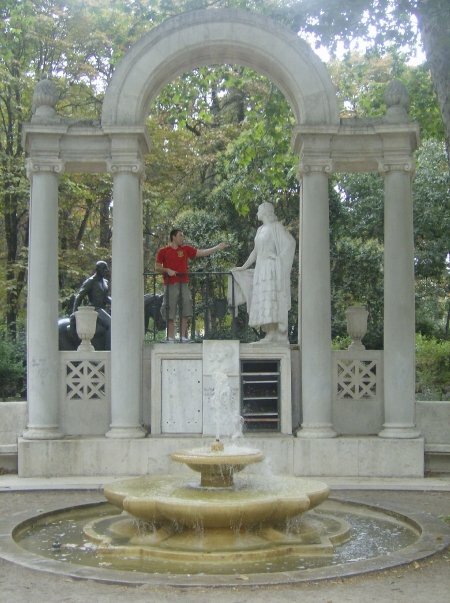 El Parque de Buen Retiro? Double check. I especially enjoyed the park because it offered a bit of relaxation in a city that is mostly business-minded. Not only are there plenty of open lawns and large trees, but the main fountain in the middle of the park was the best because you can rent rowboats for an hourly fee. It was nice to just sit on a bench and take in the more leisurely pace of life in Spain where families were out on paseos (after meal walks) and the old timers were arguing about the superiority of Los Colchoneros vs Los Merengues over some coffee. 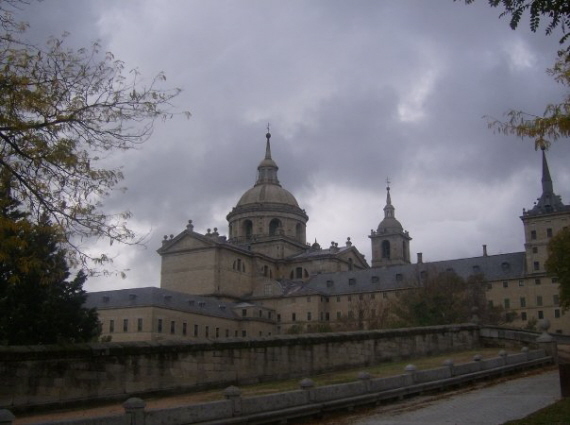 One of the best places outside of the city that I’d recommend visiting is El Escorial. 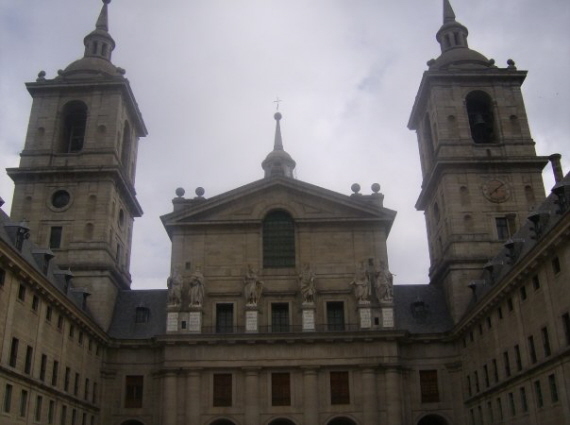 It was commissioned by Felipe II to be a royal palace and a symbol of Catholic strength in the face of the rising wave of Protestantism. The palace’s design is particularly interesting since it was designed with a grid floor plan to pay homage to the red hot griddle that Saint Lawrence was burned to death on. From the halls gilded with gold mined from New World mines to the exquisitely carved statues in the Court of Kings, it was a royal palace without equal. While I did try some delicious tapas throughout my stay in the city, the star of the food show took the form of churros at Chocolatería San Ginés located at Pasadizo de San Gines, 5, 28013, Madrid. What are churros? 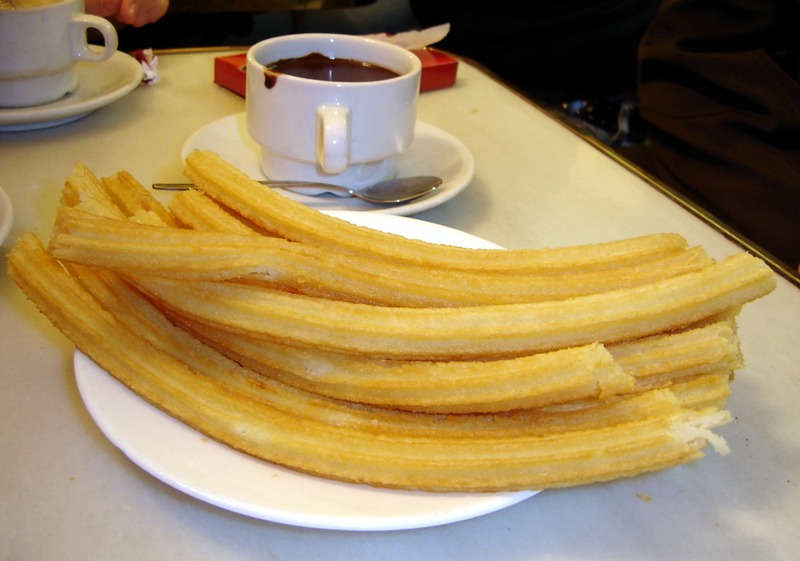 Churros are basically pieces of fried dough that are often long and thin. From there, chefs have given their own twist on them which have included: plain, coated with cinnamon-sugar, coated in chocolate, coated in chocolate and filled with caramel, or coated in chocolate and filled with custard. 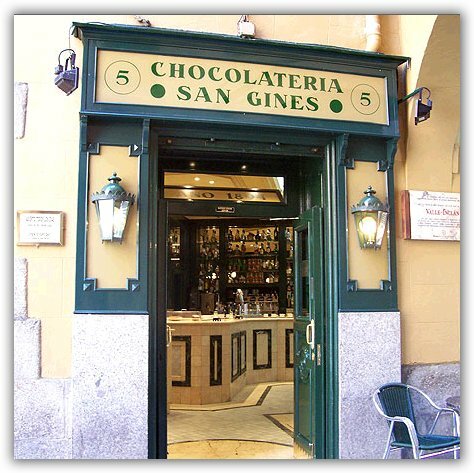 At Chocolatería San Ginés the churros are served plain with a cup of chocolate on the side for dipping. This churro shop has been open since 1894, and it has been a favorite hangout for night owls and club goers who want something sweet and greasy to fill them up before going home. I just stumbled upon it through pure chance during a normal night after dinner, and I never forgot the first time I bit into one of the golden wands of magical fried dough. They were substantial, light, and fresh out of the fryer. I could have eaten them without the chocolate due to their subtle buttery base common to many fried dough treats, but the warm melted milk chocolate took this dessert to another level. I was communing with San Lorenzo, San Gines, and the rest of the culinary saints by the end of the heavenly plate. It was a perfect end to my visit to the Spanish capital, and a heavenly denouement to this throwback series. I hope you enjoyed reading this European adventure as much as I had writing it. 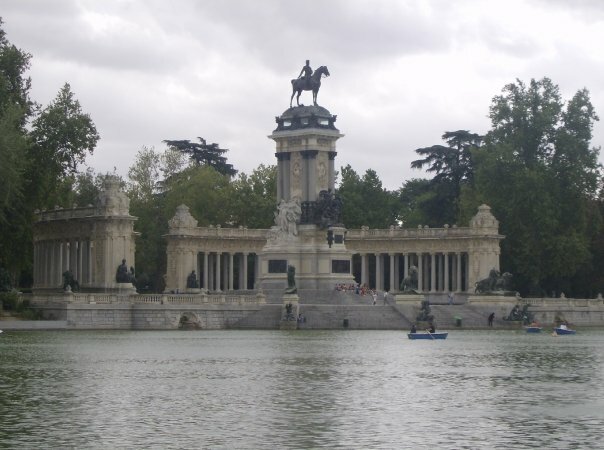 Posted in Chocolate, Desserts, European Cuisine, Spanish and tagged capital, chocolate, churros, deep, dough, fried, Madrid, melted, milk, palace, park, Spain. Bookmark the permalink. 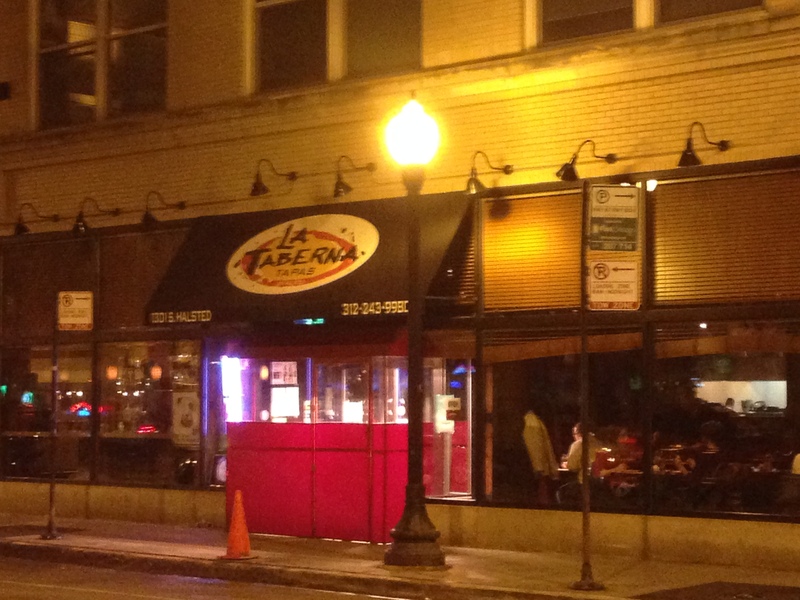 So I had originally thought of going to this place for my birthday since I love Spanish food, but instead I ended up going to the wonderful Action Grill. 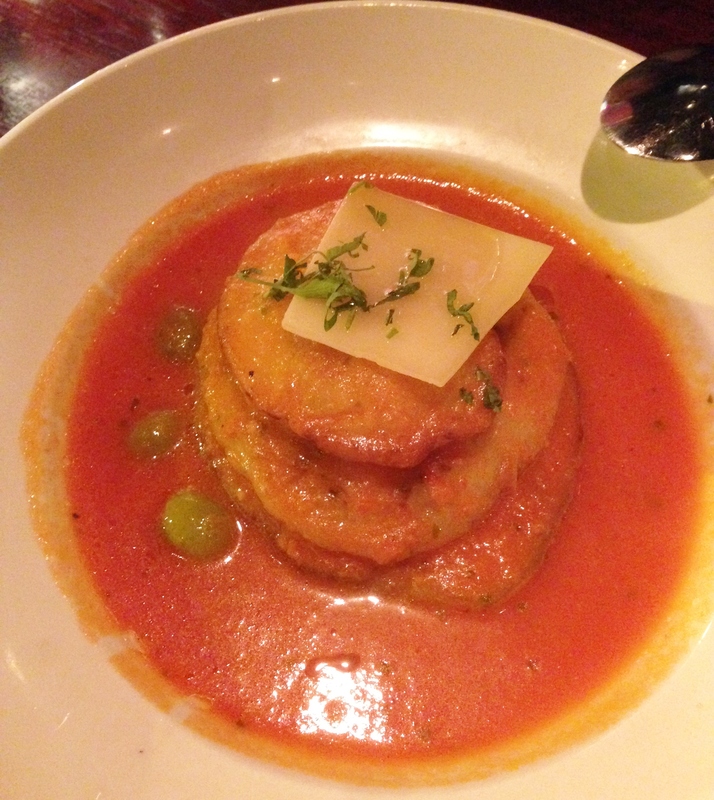 Therefore, I vowed to one day try this taperia before I left the Land of the Morning Calm. I finally made the sojourn yesterday with a fellow KOTESOL member after attending the smallest teaching conference ever with a whopping total of three people including me. 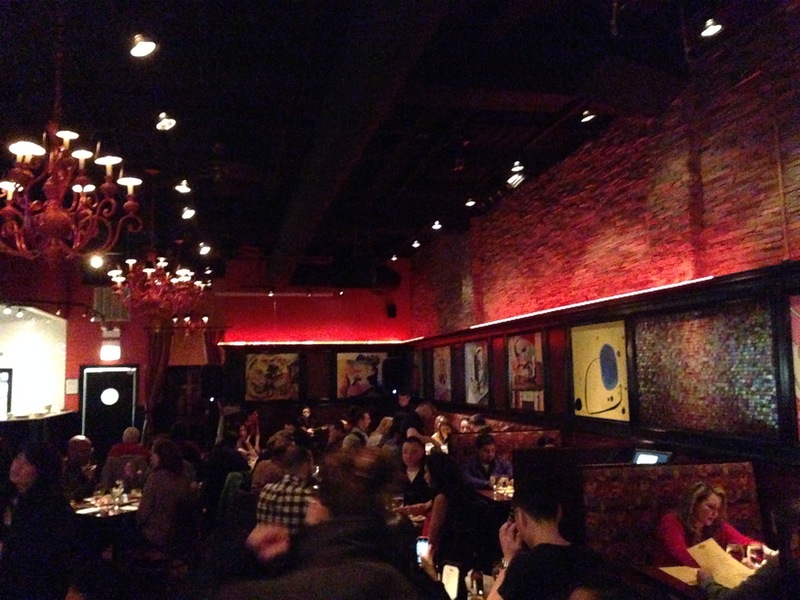 The interior had some nice, kooky drawings along with various types Spanish paraphernalia hanging on the wall. That’s about where everything “Spanish” about this place ended. First, there was the menu. 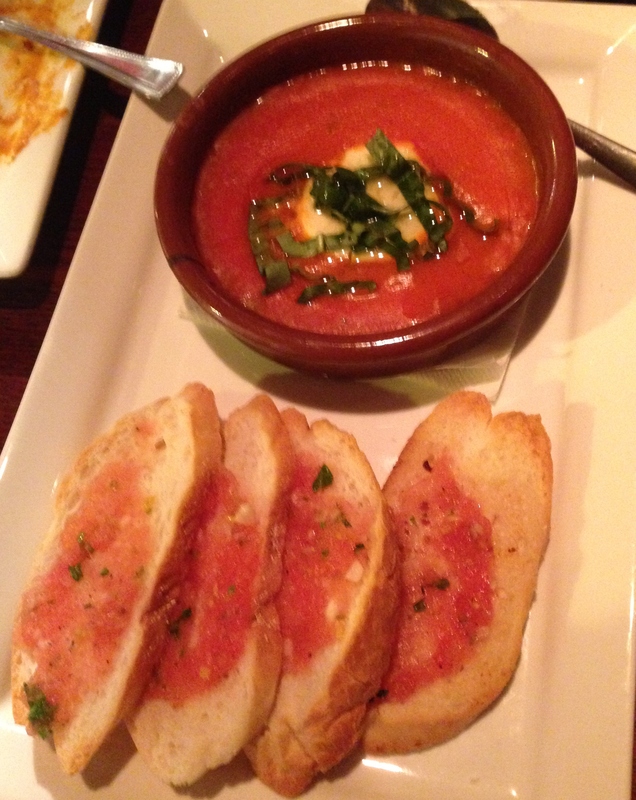 It took me flipping through five pages of pizza, spaghetti, and risotto dishes to finally get to the tapas. While Spain and Italy might occupy the same language family and are both ballin’ peninsulas, a Spanish restaurant should not have more types of pizza than tapas. 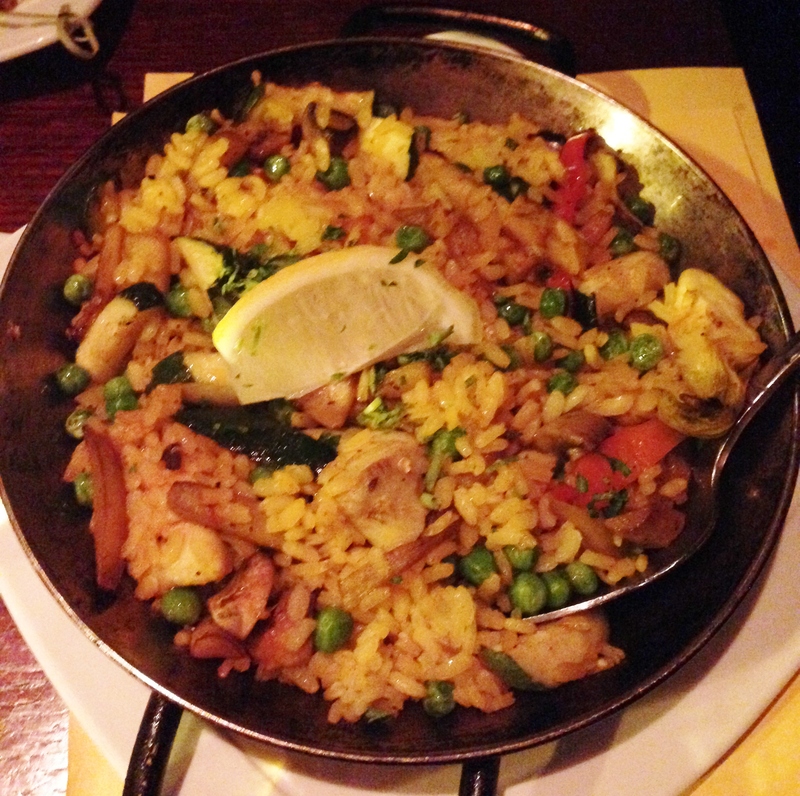 I did see that they had paella as well, but it was well tucked away like the tapas. 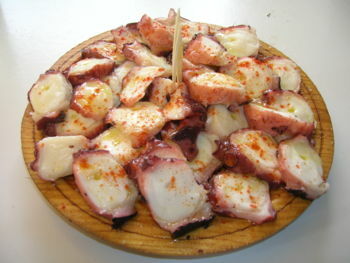 The tapas that they offered ranged from 4,000-6,000 W, and they were quite uninspired creations. Not only were they almost all seafood creations, but somehow bruschetta made it on the menu. I sincerely hope they were referring to pan amb tomaquet or else the owners need a serious culinary geography lesson. My friend and I decided to get the pizza set for 35,000 W which was a great deal since we got the following: either a Margherita or verde pizza, two 4,000 W tapas, one 6,000 W tapa, and two drinks which could be soda, coffee, house wine, or an ade. For our combo, we got the verde pizza, tortilla espanola, cooked mushrooms, roasted shrimp, and two glasses of the house wine.The first items that came out were the mushrooms along with the two glasses of wine. I found the wine to be quite pedestrian as it was of the dry red variety, but it was fine since the mushrooms were quite vivacious in terms of flavor. They seemed to be sauteed with some type of beef stock infused with pepper and had a slight woody aftertaste. These hongos were garnished with a fried egg on the side which they told us to dip the pieces into, and there were some fresh dandelion greens on top along with some savory purple olives I enjoyed. Unfortunately, this was the only plate that wowed us, so it was somewhat depressing in hindsight to know that we reached the apex of the meal after one tapa. After the mushrooms came my nemesis in Spanish cuisine: la tortilla. Now, when most people hear the word, “tortilla” they automatically think that I was just munching on some flatbread instead of making a taco like a normal person. 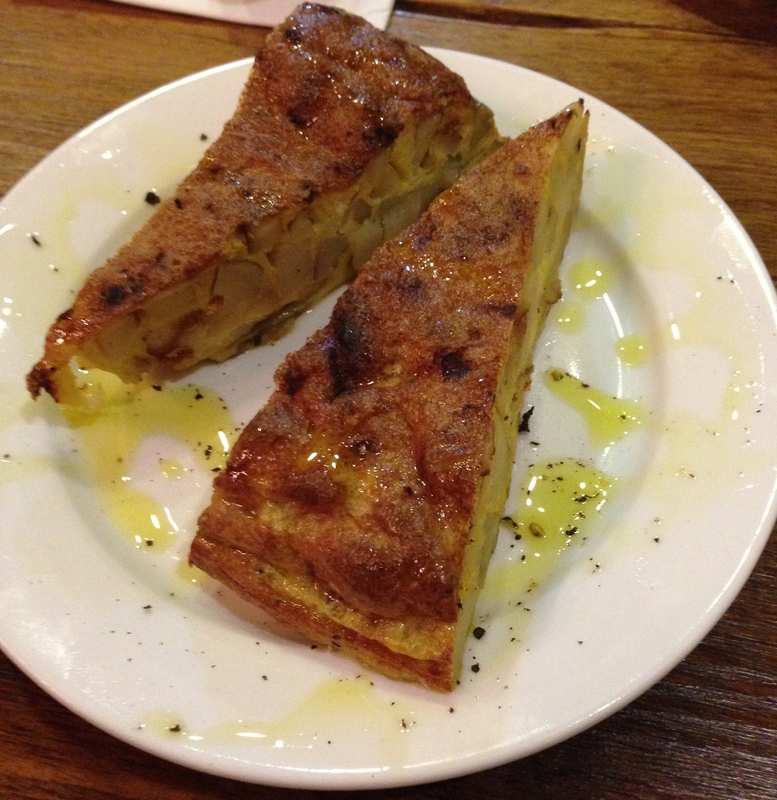 Of course I would hate it if I did that, but a tortilla in Spain is actually more like an omelet with potatoes inside. When I lived in Barcelona, I thought it was flavorless and nothing special. Que Tal tapas managed to recreate this signature blandness even more so by having a higher potato:egg ratio in comparison to the real thing. Why they would serve us such a demure tasting plate after the bold mushrooms is beyond me. The penultimate entry in this pageant of mediocrity was the grilled shrimp. Here I was thinking, “Que bien! 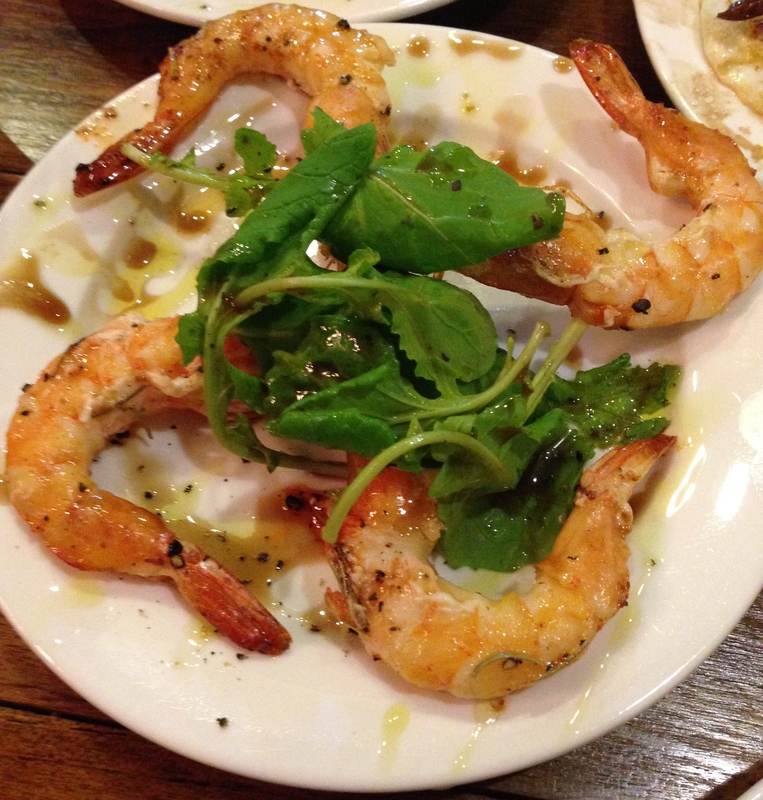 Me encantan gambas al ajillo!” (Oh good! I love grilled shrimp! ), but I was in for a rude awakening. While I admired their presentation, I don’t think I’ve ever consumed such terrible shrimp in my life. Not only was the texture of the meat extremely chewy to an unsettling degree, but they had an almost chemical-esque flavor to them. I tried another shrimp after the first just to see if I had picked a bad one. Nope. Basura (garbage). As if this train wreck of a dinner couldn’t get any more interesting, they brought out our verde pizza. 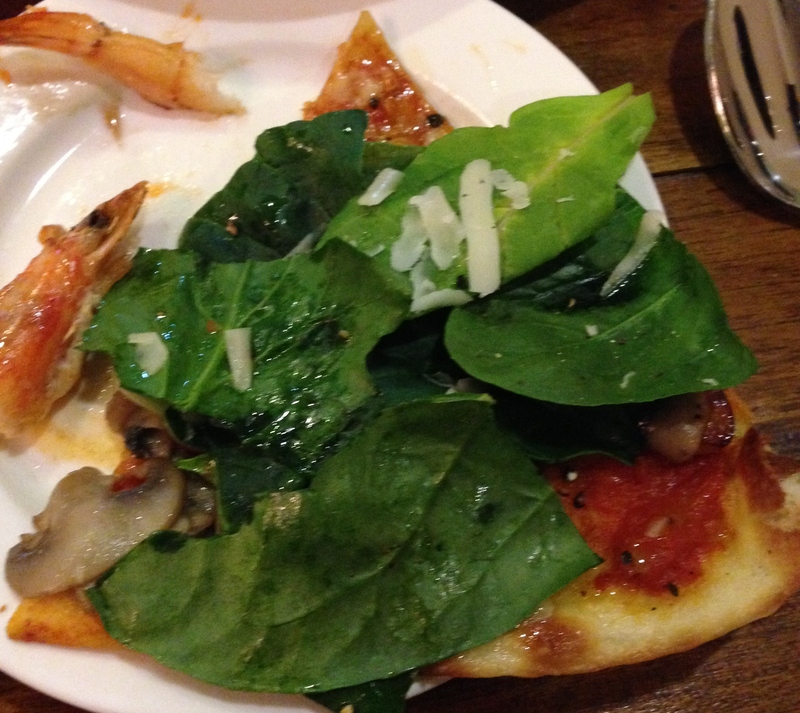 I wondered what made it “verde” (green) when ordering it, and I could see it got its moniker from the mini-garden that was chilling out on top of the actual pizza. Step 1: Find out if you got a salad or a pizza. Our waitress then said to us, “Roll” while gesticulating towards the pizza. This was very disconcerting since I’ve never heard anyone tell me to roll my pizza. I could see why she said this when I went for a piece. 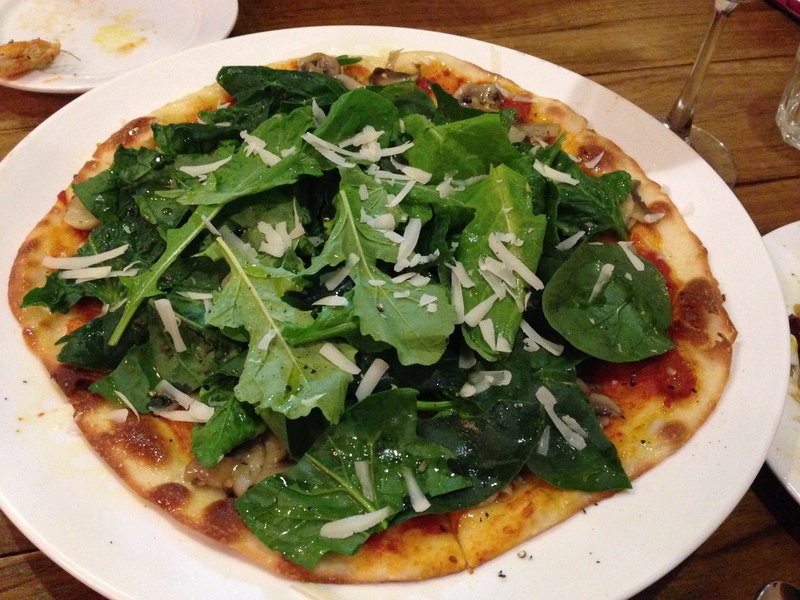 It was incredibly thin, had no cheese, and was just mushrooms and the greens. Step 2: Attempt to find a method of eating said salad/pizza. The only way you could eat it without getting half the contents on your pants was like a taco. 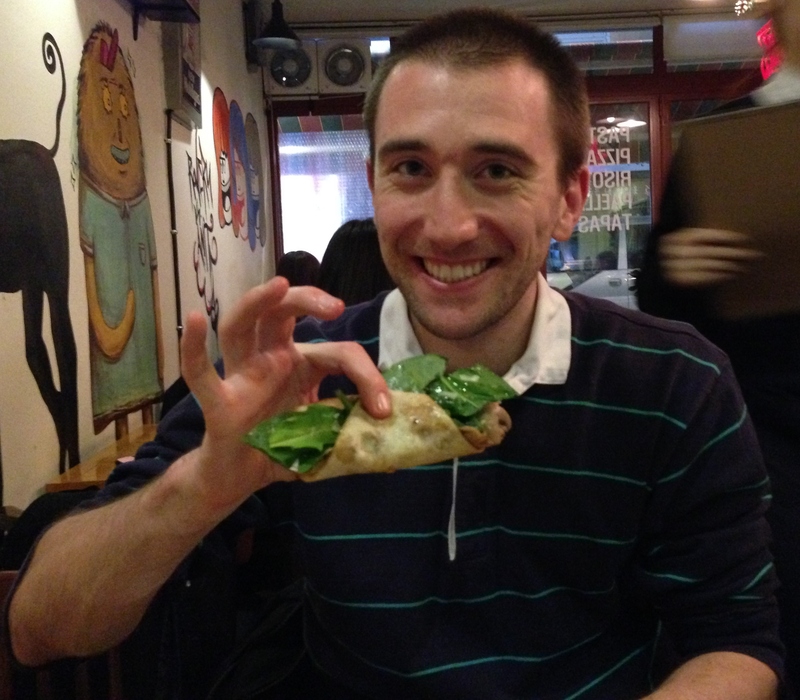 I know you fold NYC-style pizza in order to eat it better, but this pizza was just ridiculous. The taste didn’t even justify its unique consumption style. While I always appreciate an opportunity to up my fresh vegetable intake, the mushrooms were tasteless and the dough was a non-factor. This pizza was the equivalent of “that” drunk person at the holiday office party. The pizza looked like it would be a good time initially, but after spilling itself all over my hands and being really annoying to eat, I never wanted to see it again. 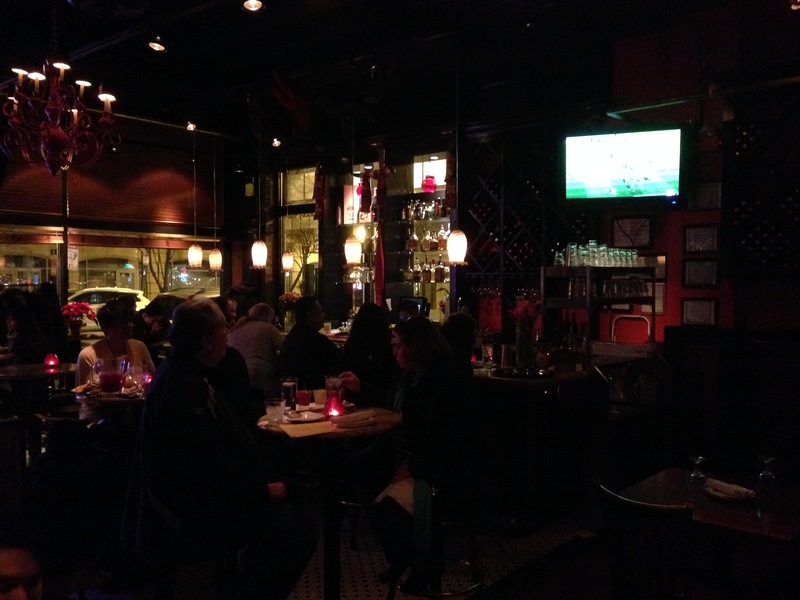 In the end, don’t go to Que Tal Tapas if you’re looking for a real tapas experience. It’s the culinary equivalent of Don Quijote fighting the windmills. It tries really hard but fails every time. 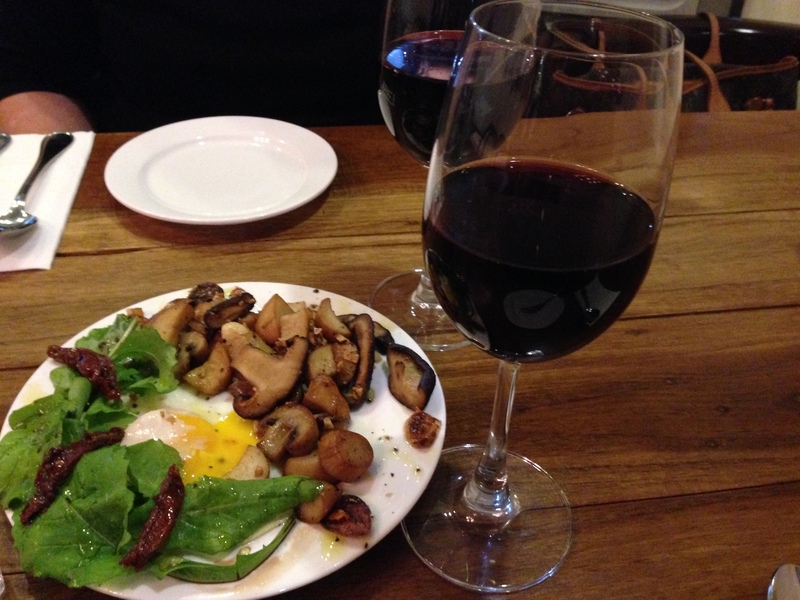 Posted in European Cuisine, Red Wine, Spanish, Wine and tagged egg, greens, mushrooms, pizza, shrimp, Spain, tapas, wine. Bookmark the permalink. Bonjou to everyone out there in the blogosphere! Welcome to another edition of Mastication Monologues where I review restaurants and recount any funny/interesting happenings along the way. 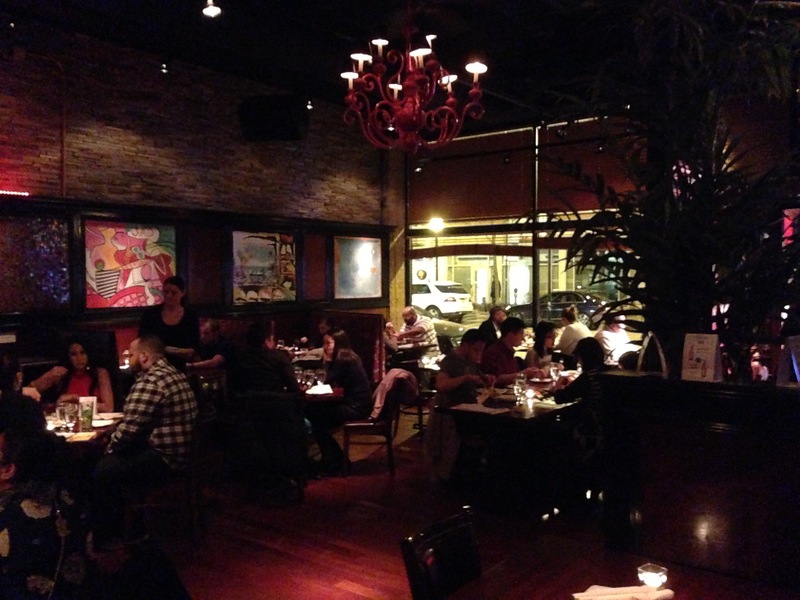 Today I will be reviewing Heaven on Seven which is located at 224 S. Main Street, Naperville, IL 60540. Along with the hot sauce bottles, we were also greeted with a free basket of sliced French bread. It was fresh but not warm, but the accompanying spreads were both new to me. One was honey butter which tasted like regular butter with a moderate sweet aftertaste, and the other spread was bean paste. 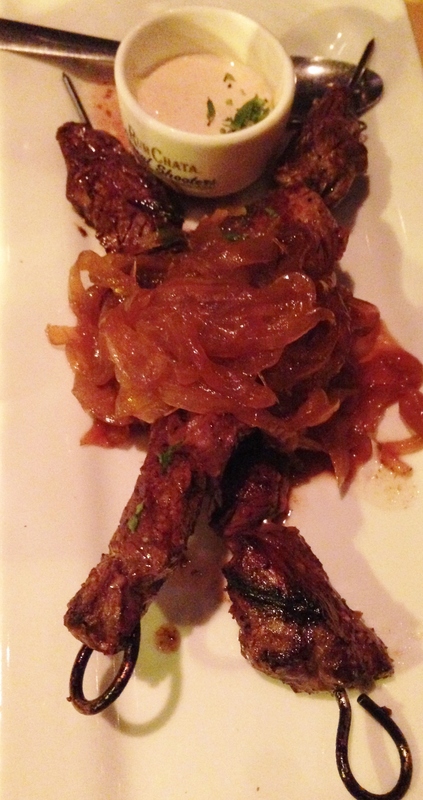 It was a fitting savory compliment to its sweet predecessor, but I didn’t care for it much. 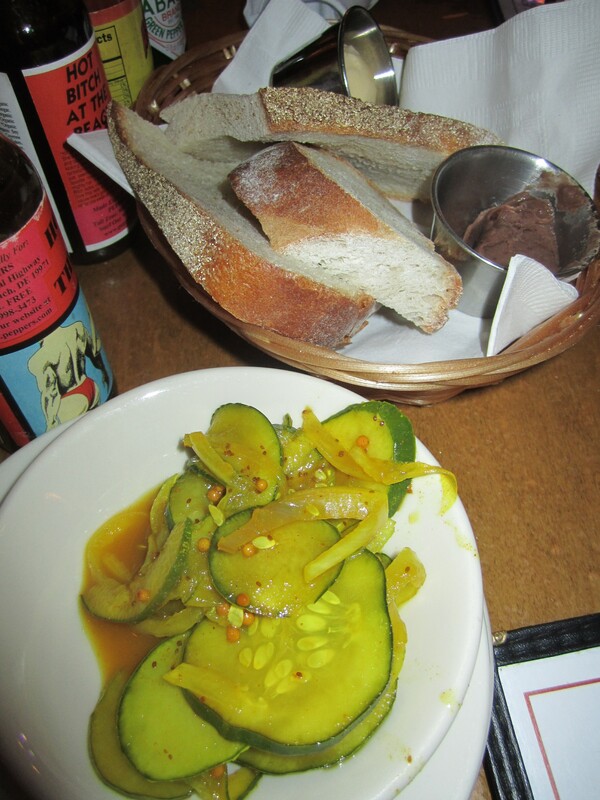 The waitress also provided us with a side of free pickles with mustard seeds and onions. I preferred this hybrid salad over the bread because the cucumbers were not completely pickled and interacted with the semi-bitter mustard seeds to create an almost sweet aftertaste. 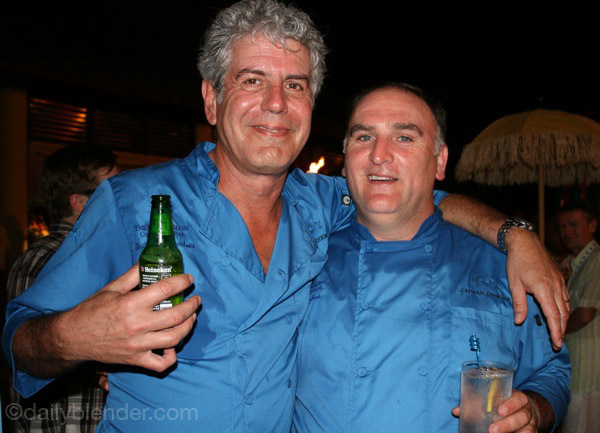 It was a bizarre mix of textures and competing flavors that somehow worked. 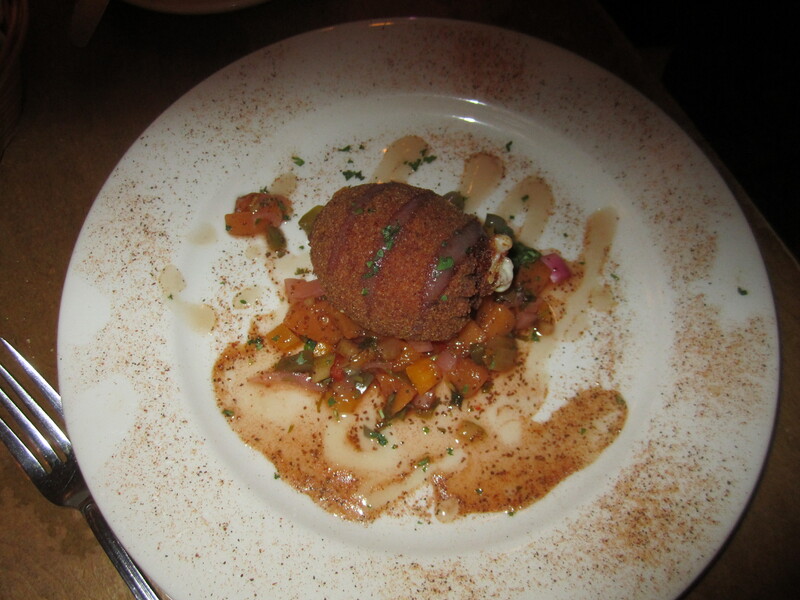 We started the meal off with the Hot As A Mutha appetizer which consisted of a habanero chile stuffed with chihuahua cheese and surrounded by peach puree and peach salsa. Personally, I didn’t think it was worth the money since they only give you one gigantic pepper, but the presentation was somewhat elegant as the diced peaches and light dusting of cayenne pepper on the plate offset the cumbersome-looking pepper in the middle of the display. They didn’t pull any punches with the habanero since they left the seeds in the pepper, and the cheese was plentiful/tasty. I also appreciated the integration of peaches with the habanero because they provided a cooling, sweet snap of the flavor whip to keep the roaring spiciness lioness at bay. 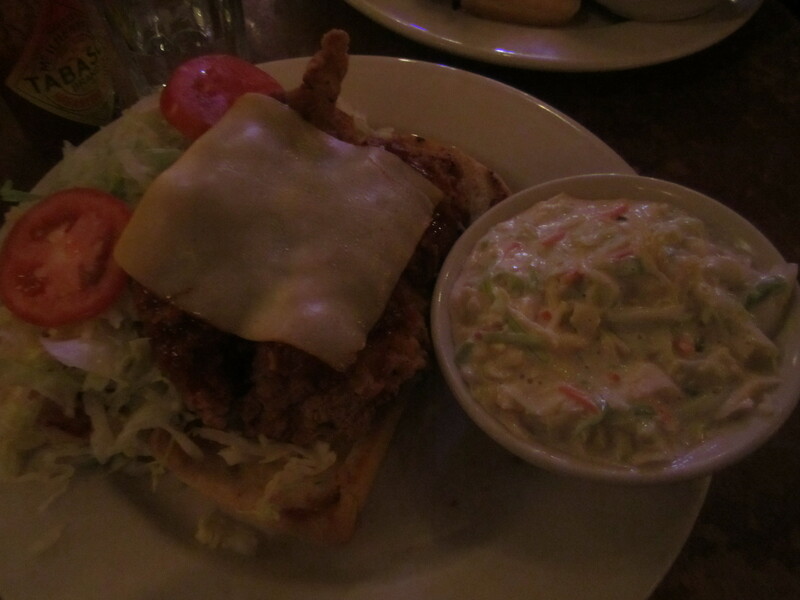 For my main entrée, I chose the Po’ Boy sandwich with the Angry Chicken option which came along with a cup of gumbo. 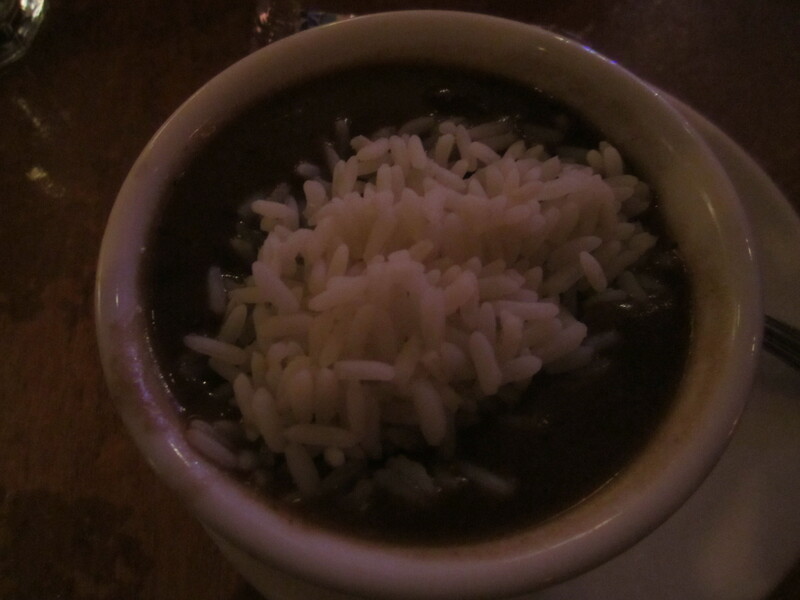 The gumbo was quite hearty and topped with a mini-mound of white rice that was steamed to perfection. I never had an andouille gumbo, but this concoction was perfect with a dash of Tabasco Habanero since it really brought out the spiciness of the sausage. As for my sandwich, it was kind of hard to actually eat as a sandwich because the contents were too overwhelming for the bread. So, I had to cut the chicken into small pieces and use each piece of lightly toasted baguette as an individual sandwich. As for its spiciness, I don’t know if my tastebuds are dead from so many years of eating really spicy food, but it really was not that spicy. 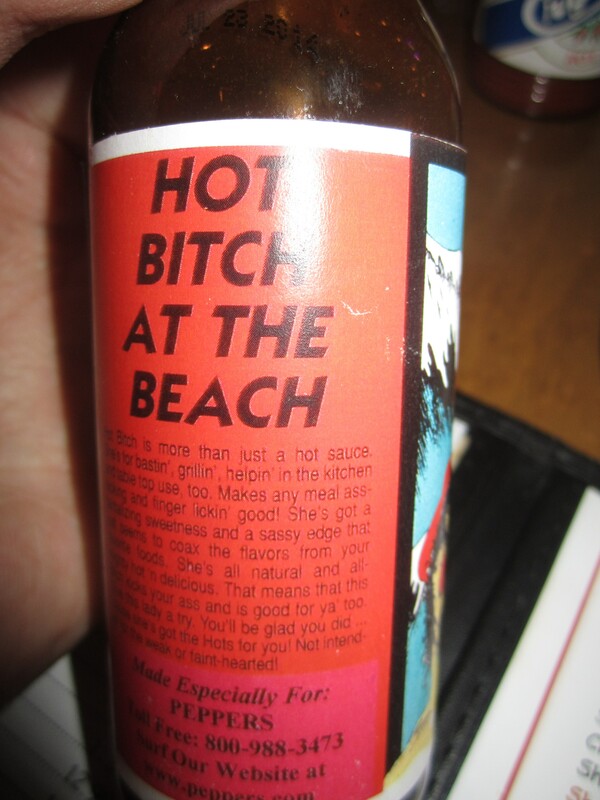 I even put on some extra hot sauce to give it a bigger kick, but I was disappointed in the spice factor. However, the chicken breading was crunchy and had a great blend of savory spices. The meat was succulent and plentiful. The accompanying lettuce and tomatoes did not add much to the dish, and the latter were grainy. I think this is due to them being out of season. I finished with it quite quickly which shocked our waitress when I told her it wasn’t even spicy. She looked a bit frightened and informed me of these spicy dinners they do for people who love spicy food. Looks like I have another challenge on my hands for another day! So if you’re looking for a little slice of the spicy, deep-fried Dirty South north of the Mason Dixon line, check out Heaven on Seven. 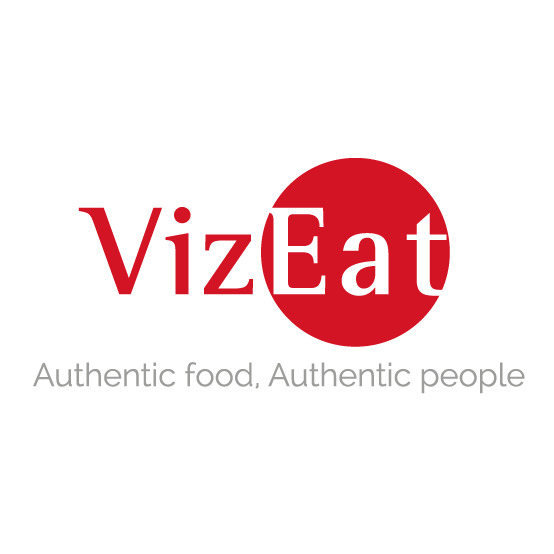 Posted in American Cuisine, Cajun and tagged authentic, bread, cheese, Chicago, Chicagoland, chicken, dining, Food, French, fried, gumbo, hot, hot sauce, Illinois, latin, Naperville, peppers, restaurant, Reviews, salad, salsa, Sandwich, sauce, sausage, Spain, spicy. Bookmark the permalink. 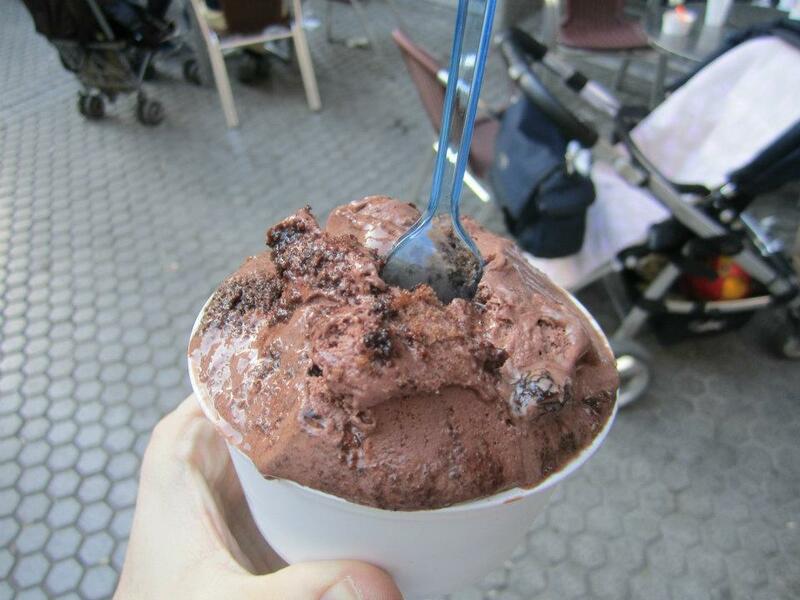 Posted in Desserts, Gelato, Ice Cream and tagged Food, gelato, ice cream, latin, local, restaurant, Reviews, sightseeing, Spain, Travel. Bookmark the permalink. Hola a todos! Welcome to another addition of Mastication Monologues, and I hope you are ready for an international recommendation. This past Spring Break, I wanted to go on vacation somewhere overseas. So I ended up planning a trip to southwestern Spain with my home base in Sevilla. 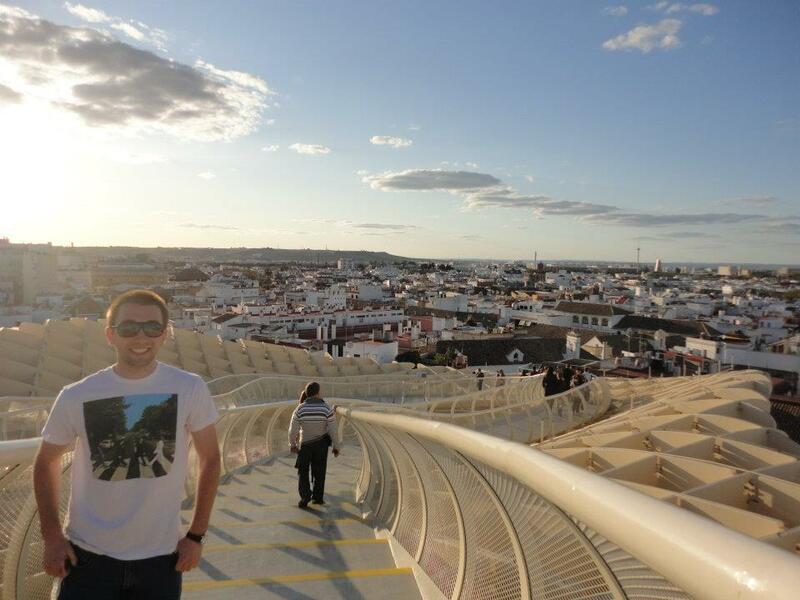 I had previously travelled to Andalucia when I was living in Barcelona, but this region called me back with its charm and all things people normally associate with Spain, i.e. 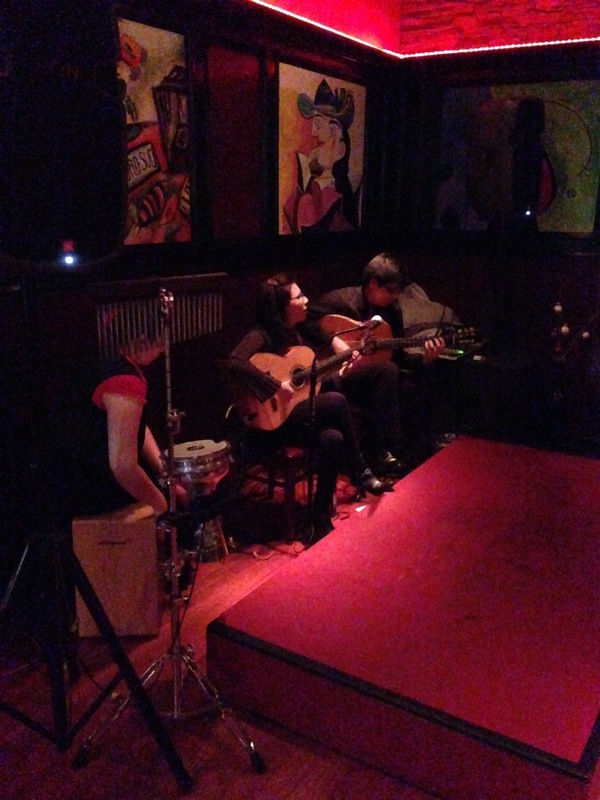 flamenco, bull fighting, and soccer. It was definitely different culturally and linguistically from Catalunya. 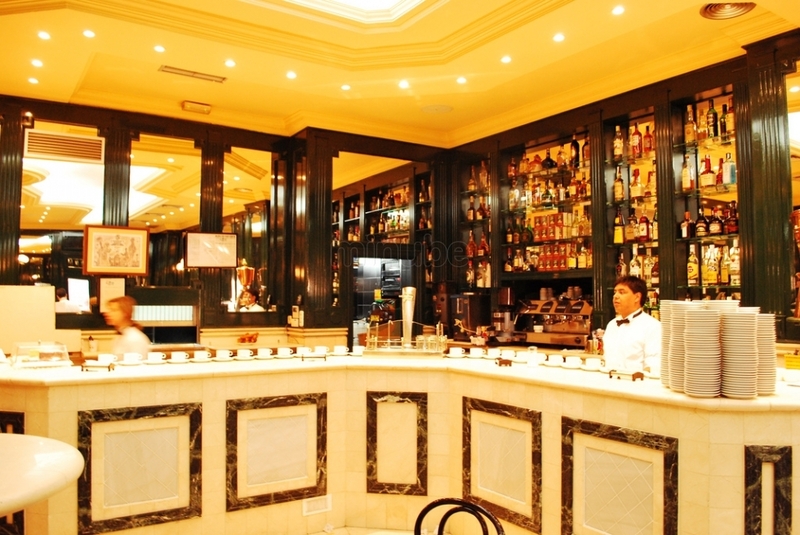 Today, I would like to talk about my experience at Cafe de Sevilla located on the corner of Paseo de Catalina de Ribera right next to the Jardines de Murillo (Murillo Gardens). As I was exploring the city’s many different tourist stops like the Catedral de Sevilla and the Plaza de Toros, I was also on a hunt for my favorite tapa: patatas bravas. If you’ve never had them, they are kind of like the Spanish version of French fries. 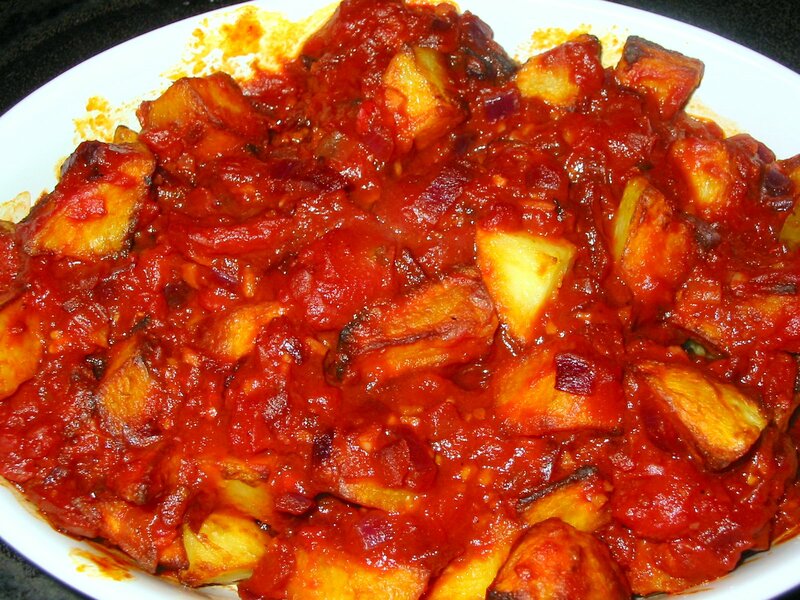 They are diced and fried potatoes that are served often times with a mayonnaise-based sauce with some type of tomato element and black pepper. However, here stateside I have yet to find a tapas restaurant able to recreate this seemingly simple dish. I don’t know if they are trying to make it fancier for American diners, but I have seen some interesting variations. Anyway, while I visited many different restaurants and cafes in Sevilla, I found that it was nearly impossible to find my patatas bravas on the menu when in Barcelona they were quite popular. This all changed on a walk back to my hostel when I decided to go to a restaurant right by the Murillo Gardens. It has both al fresco and indoor dining. For my last meal in Sevilla, I dined outside on the patio, and it has a classy ambiance with their wooden tables and canvas umbrellas. It was a perfect night for a refreshing Cruzcampo (Sevillanos are more known for their beer than wine consumption strangely enough), a plate of patatas bravas, and bull tail. I even had a funny interaction with the waitress because apparently I used the Spanish word for tail, “rabo”, that only old people in the country use instead of the more modern “cola”. 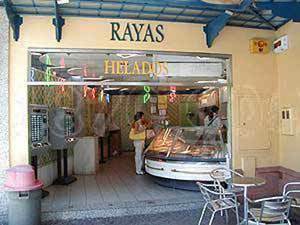 Once I established myself as being an old country bumpkin, I was excited for my last Sevillian meal. The patatas and the bull tail came out at the same time with the bravas having a much more exquisite presentation than the no-nonsense approach to the bull tail. The potatoes were perfectly fried with a slightly crunchy outside and soft, white interiors. They were drizzled with the classic, only-in-Spain patata sauce which was a bit spicier than the other varieties I have tried in other cities in Spain. However, these were special since they also came with blue cheese sauce that was not too overwhelming with the cheese chunks floating in it, and a spicy tomato sauce that may have had saffron in it as well. 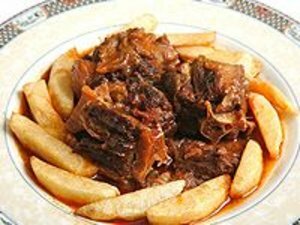 As for the bull tail, it did not look like they just took a tail from a freshly killed bull in the plaza de toros and slapped it on a plate, but rather there were three moderately-sized hunks of meat served in a beef based gravy along with a side of potato wedges. The meat itself was very tender, almost like brisket, and I didn’t even need a knife to cut any of it off the bones. As for the gravy, it went very well with the meat since it seemed to have some spicy undertones to prevent this dish from being mediocre. As for the potato wedges, they were thrown in with the gravy which I didn’t really care for since they ended up just disintegrating into the rest of the meal. Nevertheless, it was quite filling, and I was thoroughly satisfied with my meal. So the next time you are in Sevilla and want to try the best of something traditional or be a little more adventurous, the Cafe de Sevilla has a dish for everyone’s’ personal preferences. However, this city has many great establishments to dine at in its tiny, winding streets, so follow the advice of a popular Spanish saying, “El perro que anda, hueso encuentra” (The dog that walks, finds the bone). This is only part one of two on places to go to eat in Sevilla. 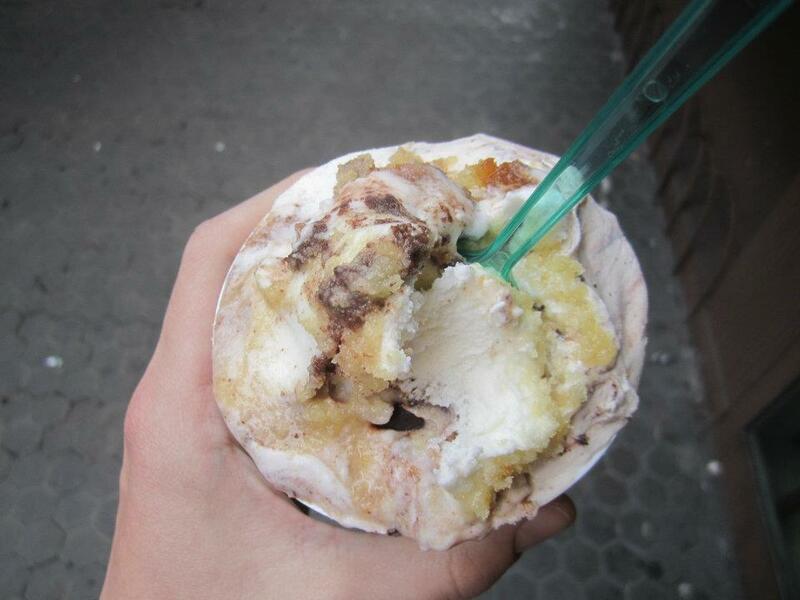 Part two involves gelato, so get excited! 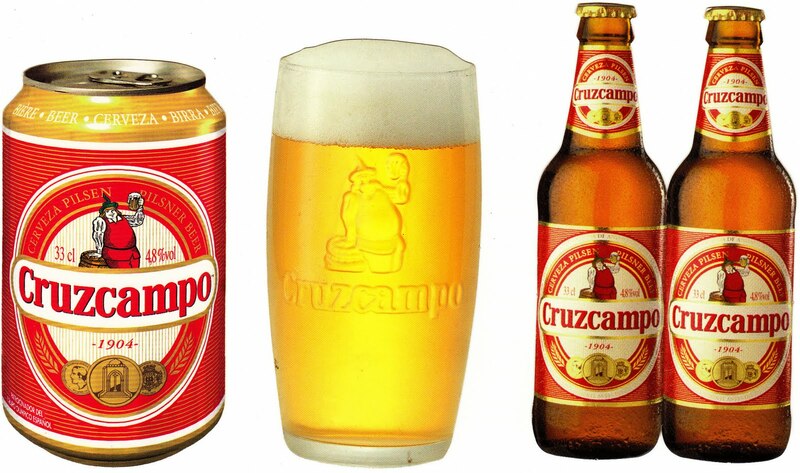 Posted in European Cuisine, Spanish and tagged authentic, Bar, Beer, Beverages, bull, cheese, Chips, Food, latin, potatoes, restaurant, Reviews, salsa, Sevilla, Spain, tail, tapas, Travel. Bookmark the permalink. Annnnd I’m back once again to pick up where I left off in this culinary cliffhanger of a blog entry. Last time I started out talking about the overall nature of the tapas restaurant Meson Sabika, and what exactly tapas are to the world foodie community. Now, I can finally get to the heart of the matter with the actual description of these lilliputian dishes that stand large on any dinner table. 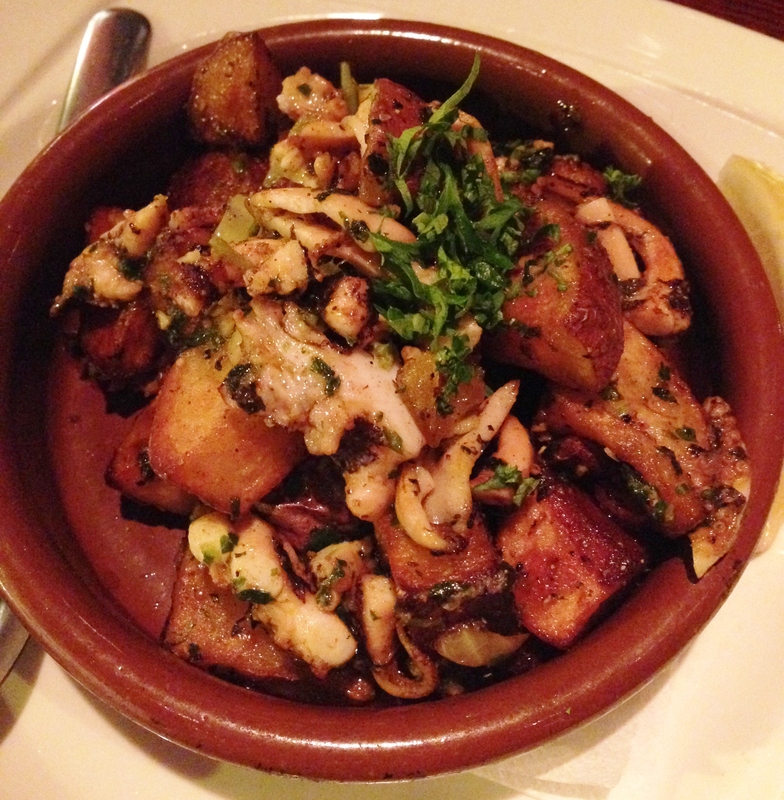 , but I can attest to Meson Sabika faithfully recreating these regional Spanish flavors stateside. They serve both hot and cold tapas in typical Spanish fashion, so I’ll just comment on two hot tapas and two cold tapas to keep it short and sweet. 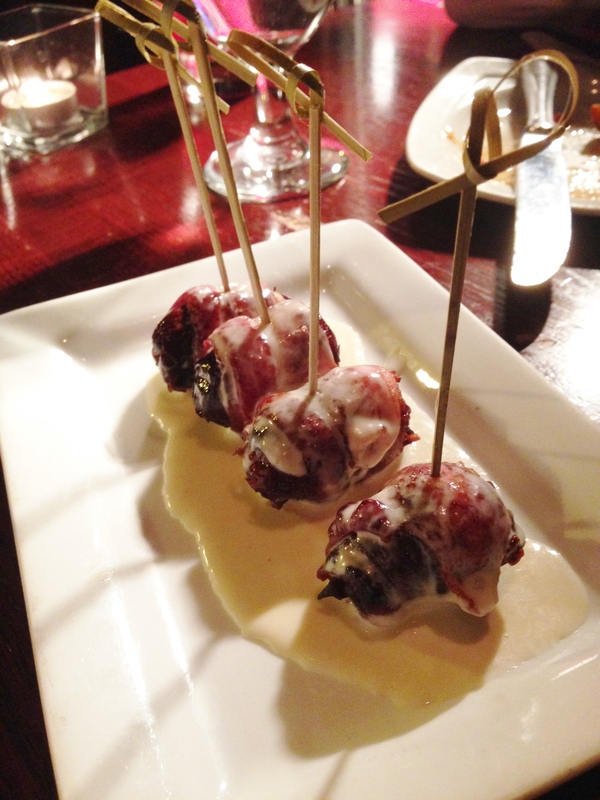 One of the cold tapas I’d recommend would be the rollito de buey (literally a “little ox roll”) which is absolutely sensational due to the fact that it uses a thinly sliced, succulent beef tenderloin wrapped around a mixture of blue cheese, dates, and Portobello mushrooms. Now some would think that the addition of dates might turn some picky eaters off, but it provides a flourish of sweetness that nicely balances the earthy flavors of the mushroom, the acidic bite of the cheese, and the savory taste of the beef. 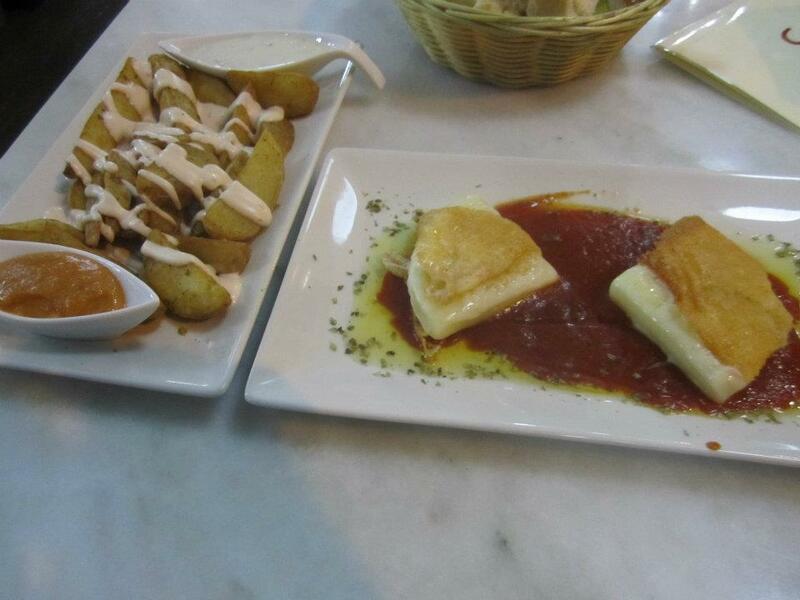 The second cold tapa I’d try again would be the patatas con alioli (potatoes with garlic and oil). 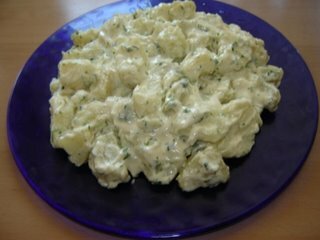 It’s a variant on your typical potato salad which utilizes the Catalan alioli mayonnaise that is molt creamy and packs quite a potent garlic punch. However, I would not recommend this if you are on a very important date or business meeting since it can make your breath quite pungent depending on who’s making it that day so tread carefully (though if you love garlic as much as I do, it’s worth it everytime). As for the hot tapas, it is a lot harder to just pick two because they have greater variety and are quite more creative in terms of their presentation. The first one you should order is the pato confitado (or duck confit for those who don’t habla español), but the name does not do this dish justice. 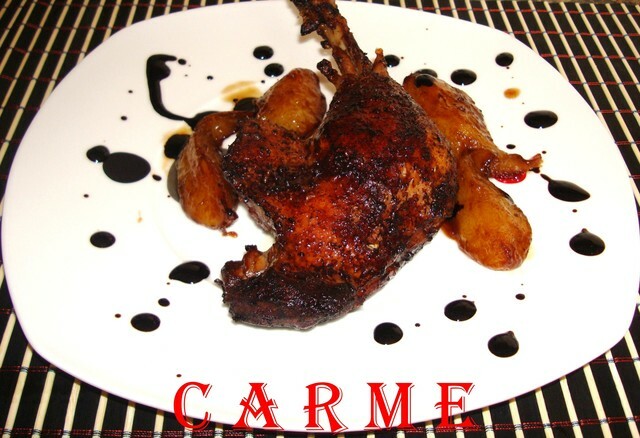 Although it is on the smaller size, like all the other tapas, it is a small leg of duck that has a very crunchy skin that leaves a sweet, smooth aftertaste on your tongue whilst the cinnamon apples provide a warm, contrasting texture to the duck skin. 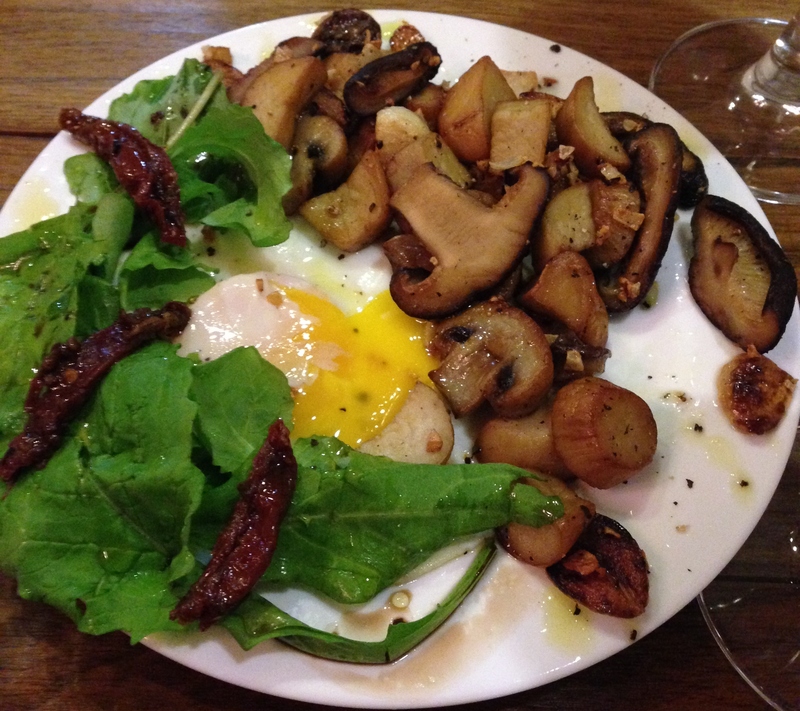 Plus, there are mushrooms that are thrown in for good measure, but they really are not the highlight of this tapa. 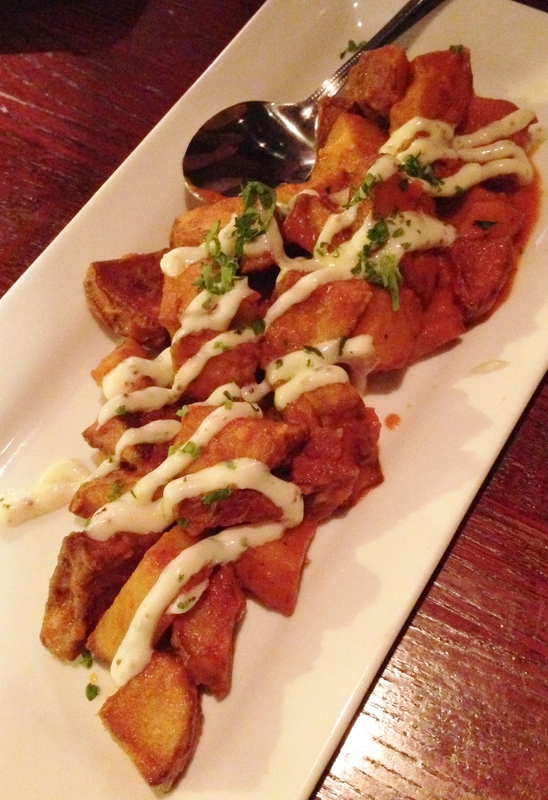 As always, I saved the best for last with my number one tapa of all time: patatas bravas. This dish is quite possibly one of the simplest of tapas, but the one that I have seen the most variations of in terms of the preparation and taste ranging from bland, undercooked tubers to the perfectly fried potato cubes served with a side of peppery bravas sauce. This aforementioned sauce, from what I have tasted in the states, has yet to be recreated with the same panache as they do in Spain, but thankfully Meson Sabika provides their own adequate touches to this fan favorite. They dice up and fry fresh potatoes in a bowl while lightly covering them in a tomato based sauce that is not very spicy, and these potatoes are then covered with a generous helping of shredded Manchego cheese. Even though this is not the traditional bravas I pine for, they are quite filling and the paprika in the sauce provides a punchy zing at the end of each bite that makes me always come back for more. 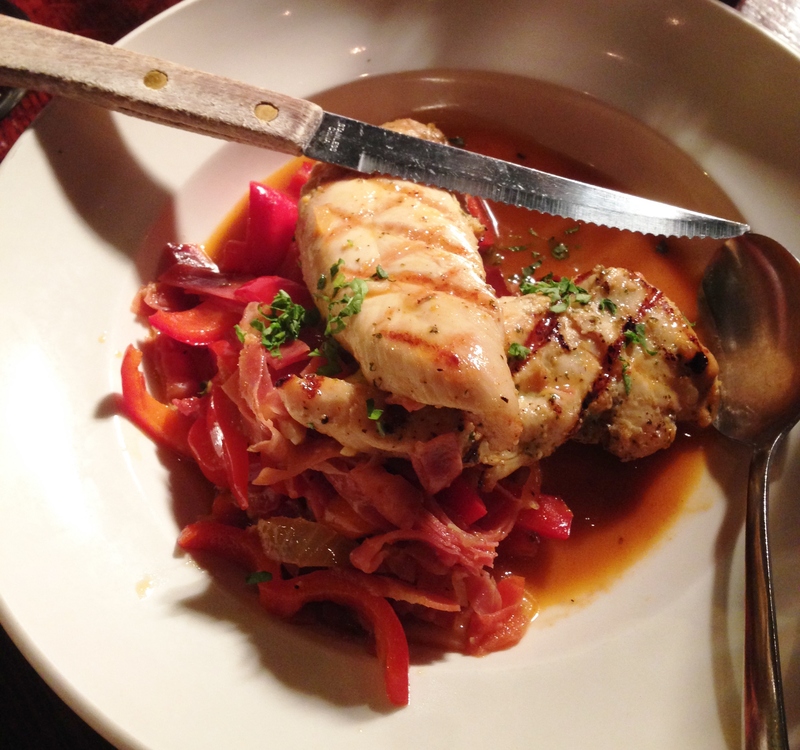 Overall, Meson Sabika provides a small slice of Spain in the Chicagoland area in the most elegant of settings. 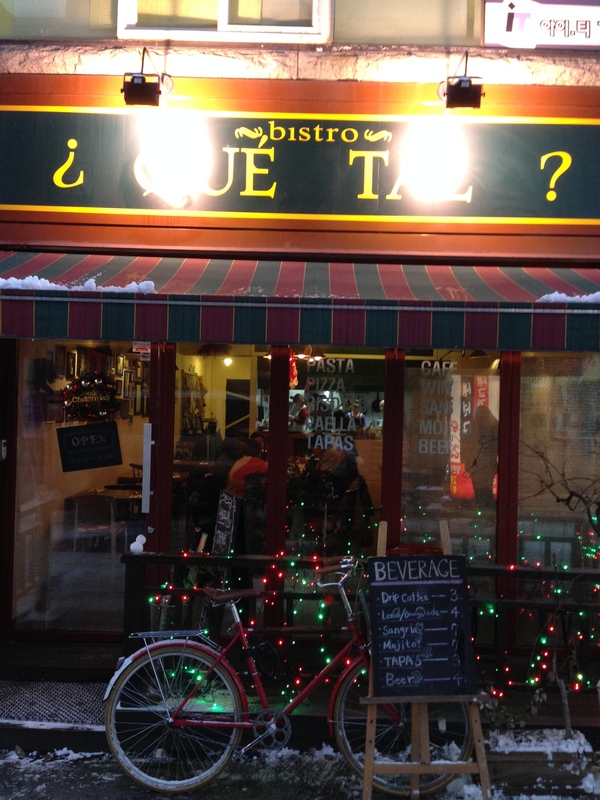 The prices are decent, the food is fresh and delicious, and the atmosphere is ideal for any sort of occasion. 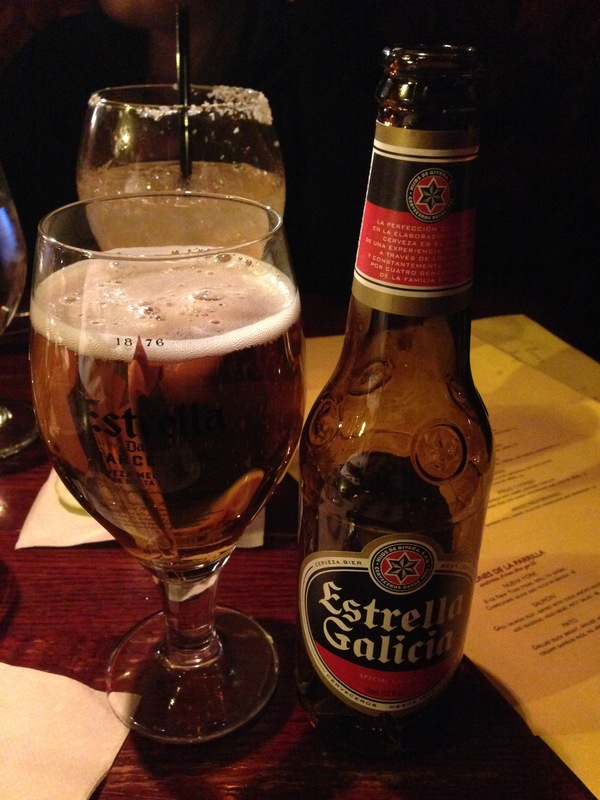 To close with two of my favorite Spanish sayings, I say hasta luego y ¡A beber y a tragar, que el mundo se va a acabar! (Let us eat and drink for tomorrow we die!). 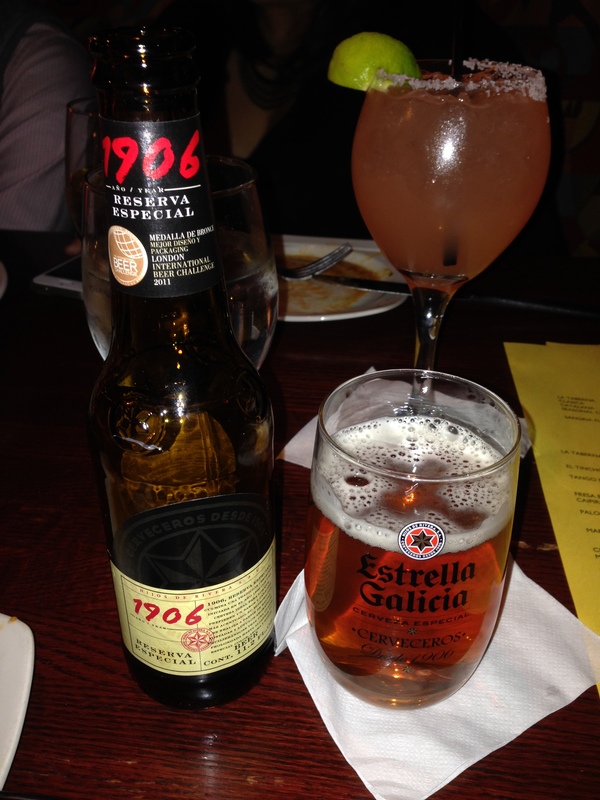 Posted in European Cuisine, Spanish and tagged Bar, cold, Drinking, Food, hot, Naperville, potatoes, recommend, restaurant, Reviews, Spain, tapas. Bookmark the permalink.